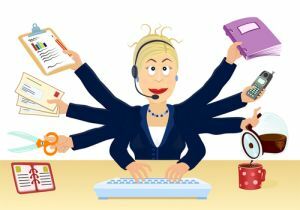 Why Administrative Professionals are Your Best Friend in the Business World. You rock...and we know it. How many times have you heard that dreaded sound coming from the copy machine? You know, the sound of paper crunching and the copier making that weird noise that means only one thing? PAPER JAM! As a wave of panic begins to wash over you, you quickly scan the office for the one person who can solve this disastrous problem….your friendly, helpful Administrative Professional! In my humble opinion, Administrative Professionals are the crux of any work environment. From answering the phones to creating spreadsheets and proofing power point presentations, we can do a plethora of tasks assigned to us at a moment’s notice. We support individuals, departments and entire offices. We love helping people, making their lives easier and making sure offices run in efficient manner….we are, your best friend! Make sure you keep that in mind, because Administrative Professional’s day is coming up soon – April 23rd, and you’ll want to make sure you thank those you work with for all they do. Some great ideas are a workspace makeover, buy them lunch, let them work a half day, or a spa gift certificate! Whatever you do, even if it’s just a card, make sure you let them know how much you sincerely appreciate them.